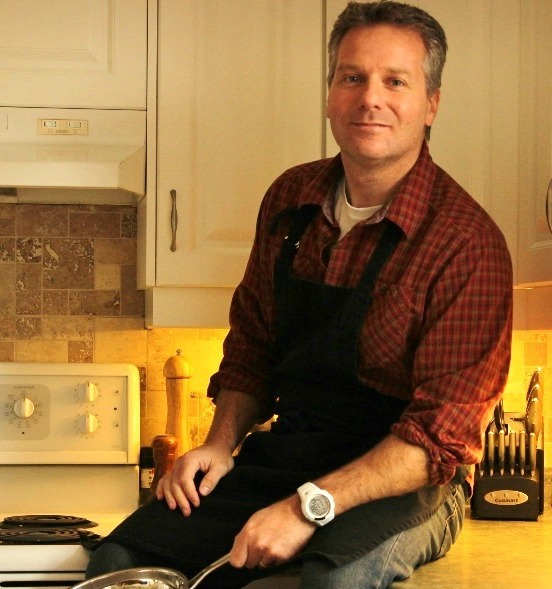 The other night, while aimlessly flipping through television channels, I saw a show hosted by Bob Blumer on Food Network Canada. He was showcasing a restaurant called The Waffle Shop. As the name suggests they serve homemade waffles. But that's not all they do. They also broadcast a live-streaming talk show with their customers. It looked like a fun place to go! It reminded me of a quirky sandwich shop in Chicago I stumbled upon last summer where the bathroom walls were covered with a blackboard material so you can leave messages. Seeing the light and fluffy homemade waffles being made on T.V made me want to get my own waffle maker. For now I'm stuck with buying frozen waffles. They're not the tastiest things but on the plus side they're quick to toast and easy to perk up with healthy toppings. 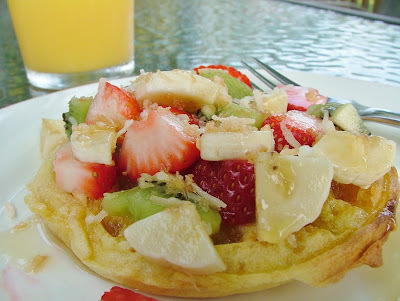 Here are three of my favorite ways to top frozen waffles to make them healthier and more exciting! Stack your waffles with sliced fresh fruit, sprinkle on some shredded toasted coconut, drizzle with maple syrup and you have a tropical island breakfast! Top each toasted waffle with equal amount of bananas, strawberries and kiwis. Heat a non-stick over medium heat. Add 1/4 cup sweetened shredded coconut. Cook and stir until coconut begins to turn a golden brown, about 3 to 4 minutes. Remove from heat. Sprinkle toasted coconut over fruit and drizzle on maple syrup. Make with LESS effort: Add the shredded sweetened coconut without toasting it. 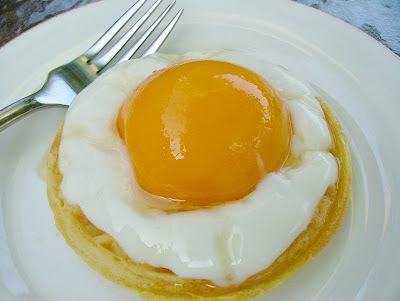 It looks like an egg on a waffle but in fact its low-fat vanilla yogurt topped with a canned peach halve. Top each toasted waffle with equal amount of yogurt. Place a peach halve on top of each waffle. I love all that extra blueberry juice you get when thawing frozen blueberries in the microwave. It makes the waffles look and taste so good! Place frozen blueberries in a microwave safe bowl. 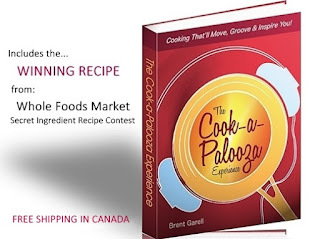 Cook in the microwave for 30 to 40 seconds or until blueberries are thawed. Remove bowl from microwave. Add lemon juice and sugar to bowl. Stir to coat blueberries. 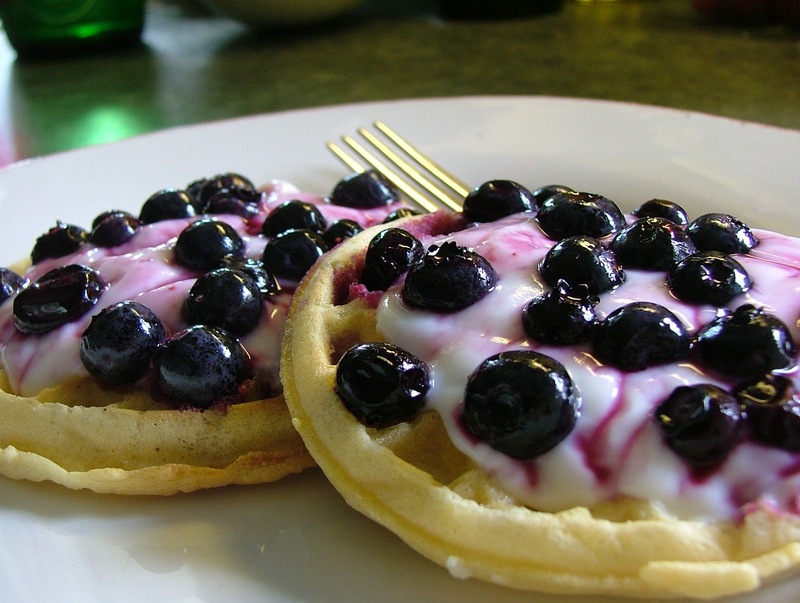 Spoon equal amounts of yogurt over toasted waffles and top with thawed blueberries. Drizzle any extra blueberry juice on top. Make with LESS effort: Skip adding the lemon juice and sugar to blueberries and drizzle on maple syrup instead. What's your favorite waffle topping? Join the Newsletter... and get instant access to MORE recipes and inside tips every other week so you can cook and eat right with LESS effort! It's Free! Oooh, I love that tropical fruit idea. Yummy!